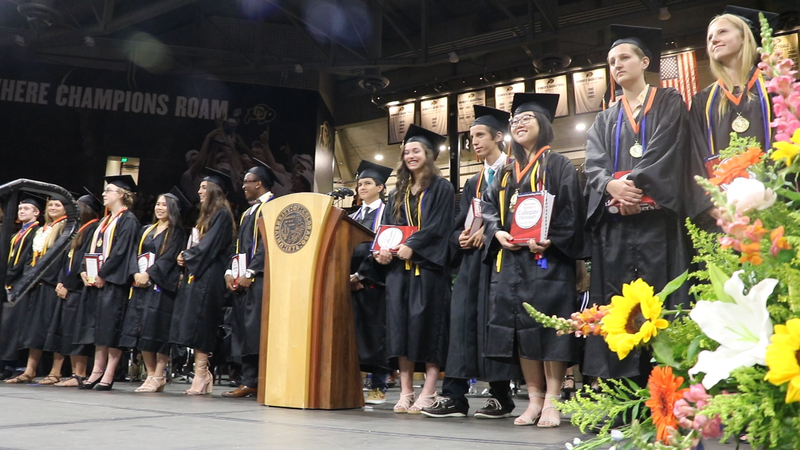 It was a rainy day for Lakewood High School's graduation ceremony at the CU Events Center on May 19, but the gray clouds and steady rain didn't do anything to damper the celebrations. "Do not forget the power of community," advised honored speaker Nicholas Ophaug, Outdoor Lab program director. "Know you are a valuable addition to the success of any community become a part of from here on out." Speakers like Deksyos Damtew and Principal Daniel Bock encouraged graduates to take risks, and be unafraid of failure. "You never learn anything if you get everything right on the first try," student speaker Maggie McManus said. "Right now being pretty, popular and liked seems like the most important thing, but it's not. Be kind. That's the most important thing." The ceremony ended, as so many Lakewood events have, with the school's motto - "It's great to be a Lakewood tiger!"